Where does the corporate facility role in enabling green behaviors begin and end? I have been thinking about the numerous requests and suggestions that many facility planners and managers receive to enhance recycling, landscaping and other 'green' facility management practices. Most are usually delighted to observe heightened employee desire for eco-friendly workplace features and are eager to take on new challenges to meet the demand. 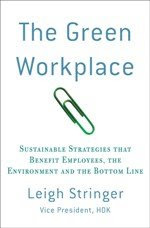 It seems ironic that when roles are reversed, and facility teams are challenging employees to develop 'green' work habits, the subsequent reactions range from subversive disregard to hostile rejection. This is not a 'rant,' but an observation that facility management professionals are now faced with learning a new discipline - many are quickly becoming leaders in demonstrating the paperless office and showcasing the benefits of conducting paperless meetings. Why? 'Learning and greening by example' is a potent way to influence the business units we serve. It is no longer adequate to simply identify a business need in the workplace and then supply and support the service - we have to 'drink our own champagne' or 'eat our own dogfood,' depending on the way you want to look at it! Many corporations are probably comparatively similar in the proportion of employees who have had the technical resources to digitize their office and conduct paperless meetings for years. Often, these are technologies that are hardly ever used. Schedule use of projectors and groupware when conducting meetings with powerpoint presentations to eliminate the need for paper copies. When using groupware, go out of your way to demonstrate electronic document markup techniques if possible. After taking meeting notes on paper, scan to your email and file electronically. Then recycle the paper. Go out of your way to drop recyclables in the appropriate container - it is slightly inconvenient to haul empty water bottles and diet coke cans, but others will notice and follow your lead. Capitalize on opportunities to showcase how to use videoconference capability to eliminate business travel or to enhance team collaboration. Offer incentives to reward behavior, like a prize drawing for attending training on digital work practices. P Think before you print. 10 fewer pages/week/employee = 3619 trees saved. q This message is printed on 99.9% recycled electrons. Please contribute any ideas that you have!